View More In Lifting Cranes. Vestil AHA-4-8-10 Adjustable Height Aluminum Gantry Crane combines lightweight and rigid, sturdy construction into one unit. The all aluminum construction of this gantry crane makes it corrosion resistant and perfect for outdoor use. 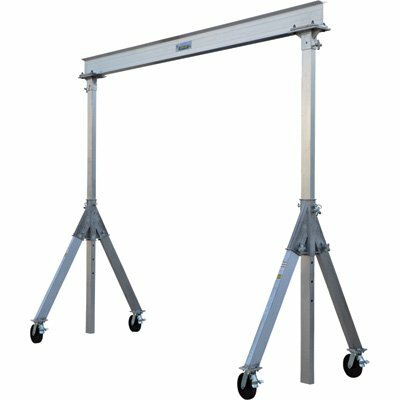 The lightweight I-Beam allows height adjustment without the need of a hoist or fork truck. All pined connections make it possible for single person set up and take down in just minutes. Included are two straps, allowing one person to transport the gantry crane in one neat package. Unit comes standard four (4) position locking swivel casters with roller bearings. Locks the rigging in 1 of 4 positions; you can set the wheels and push the gantry crane forward, back, left or right. There is an optional Total Locking Casters that lock the rigging in any position and locks the wheel from rotating.